Mr. Siegel had good cause for concern. Children are born with two fears: the fear of falling and the fear of loud noises. All other fears are learned from adults. What pictures are we painting on the evening news? A depressed mother drowns her children. The school board votes to install metal detectors. A child is kidnapped in a carjacking. Fear is the expectation of these dangers. Left untreated it brings emotional and spiritual sickness. The first task of an emergency room staff is to determine the level of acuity (severity): green, yellow or red. Code green means the patient’s needs are not urgent (setting a broken bone or minor stitches). Code yellow notes a serious problem that if left untreated becomes critical. Code red signals a life-threatening trauma. A skilled teacher, like a trained nurse, can observe students’ fears and save lives. Here are some ways to turn your classroom into an emergency room of healing and hope. Treatment: Natural fears should never be taken lightly. God never forgets how large our problems look to us. 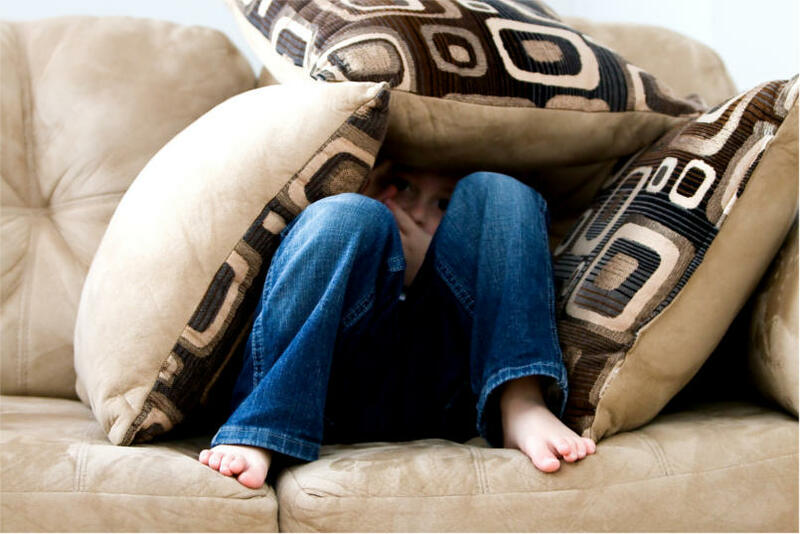 More than fifty percent of children experience normal phobias (fear of a specific object) or anxieties (more general worries). ART—Ask children to draw pictures of their fears. They’ll discover others drew the same things. Did they include people? Are the people large or small compared to the fear? Try this project several times a year and keep a file. Art can give good clues to the severity of a child’s fear. DIARIES—Older children can express themselves in a journal or diary. Keeping records may reveal changes. When verbalized, fears may not look as bad as they seem. Students who share their entries exchange valuable insights. Treatment: “Have you ever wished for someone big enough to take care of whatever scares you?” asks editor/author Mary Lou Carney. “There is someone like that, someone with more power than all the superheroes rolled into one—God!”3 Kids can learn to trust God for help and courage to overcome fears. But Miss Carney tells children that God also expects them to stay away from what scares them when possible. OBJECT LESSON—A few years ago I taught a unit on courage. To show that God helps us overcome fear, I challenged Bradley, a painfully shy third grader, to give a demonstration on how to fold a paper drinking cup. His classmates stared in amazement as he did a super job and even served Kool-Aid for a snack. Afterward they cheered and talked about that lesson for months. I assured them God rejoices when they accept His strength to overcome their fears. DRAMA—The fear of visiting the doctor or dentist is powerful at any age. Stage a classroom medical skit. Invite a nurse or doctor to answer questions. “I try to calm children’s fears by letting them know exactly what I’m doing,” said Dawn Verbal, an ER nurse in Orlando, Florida. “If it’s going to hurt I tell them the truth.” Talk about the care the Good Shepherd gave the lost, injured lamb. Remind them that the Shepherd can keep them safe, too. Symptoms: Fast heartbeat, stomachache, headache, aggression or withdrawal, panic disorders. Code-red fear usually includes the fear of violence. Children ask, “Can God help?” Children who experience violence need help to work through their fears and claim the rest of their lives. When a child is expressing anger stop and ask yourself: Is there something this child is afraid of that could be triggering his anger? Treatment: Love is good medicine. “Perfect love casts out fear” (1 John 4:18). Love and fear cannot survive together. Fear is negative. Love is positive. Tell children to look for God’s love in every situation. OBJECT LESSON—Float an ice cube in a glass of water. The ice cube represents a child lost in an ocean of fear. Ask a child to pick up the ice cube with a piece of string. He may try to tie the string around the ice cube, which won’t work. The string represents God, who wants to rescue us. Place the string on top of the ice cube and sprinkle salt, representing God’s love, over it. Then wait a few minutes. The string will stick to the ice and you’ll be able to lift the ice cube right out of the glass. FRIENDSHIP—A fearful child needs a caring friend. Start children’s prayer cells. Host family retreats and support groups. Recommend Christian counselors. Be a good listener. You may be the one who learns the most. I’d tell Mr. Siegel that it’s okay for children to see adults afraid if they also witness their faith. I’ve walked through the park with children who’ve buried a pet, driven boys to meet new foster parents and held the hands of girls in the hospital. I’ve prayed with children scared of earthquakes, drunk teenage brothers and not making the baseball team. I’ve sat beside too many trembling children in family court. In the emergency room of life I’ve watched children trust God through their fears and in these examples I’ve found courage.